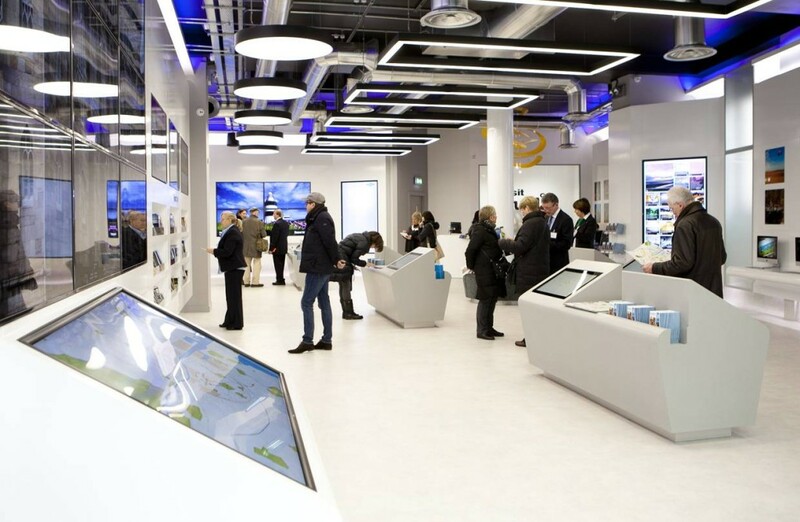 Fáilte Ireland has just opened a new state-of-the-art Tourist Information Office in Dublin. The new futuristic center offers the ultimate in technology to ensure trips to Ireland can be planned at ease. The new center marries the latest digital high-tech delivery of information with personal interaction and a warm Irish welcome. The center, located in the heart of Dublin city centre, is complete with interactive pods, a social media wall, Apple Macs and touch screen technology. Ireland’s most high-tech and state-of-the-art Tourist Information Office has just opened in Dublin. The social media wall is a large display showcasing daily social media activity including all posts and tweets which include #lovedublin. The wall displays images not only of Dublin but the whole of Ireland on a live basis. Interactive pods are also one of the main features of the center which enable people taking a vacation in Ireland to access information quickly and efficiently. A large map displays key locations and attractions throughout Dublin city and county “All Dublin has to offer is only two touches away,” according to Fáilte Ireland. The “what’s on” area shows the best of events, concerts and special events taking place over the next few days where visitors can also book events that they wish to attend there and then. The Ireland area showcases imagery and videos of Ireland’s most stunning locations including the now famous Wild Atlantic Way 2,500km route from County Donegal to County Cork. This feature is ideal for those wishing to venture to other parts of the country or those on a self drive tour of Ireland. Also blank maps allow visitors create their own map by marking their key attractions to visit as well as routes to get there. Lastly the “App Wall” allows visitors download new tourism apps including the new Wild Atlantic Way app. This entry was posted in Best Attractions in Ireland, Best Places to visit in Ireland, Cork, dublin, Ireland, Ireland Travel, Ireland vacations, Ireland Vacations 2015, Self Drive Vacation Ireland, Travelling around Ireland, vacation to Ireland, Visitor Attractions, Wild Atlantic Way and tagged Self drive tour of Ireland, Tourist Information, Tourist Information in Ireland, Trip to Ireland, Vacation in Ireland, Visitor Attractions. Bookmark the permalink.